The Harvest Festival is held in Boyne City's downtown with music, crafts and fall produce, and is jointly organized by Boyne City Main Street and the Boyne Area Chamber. The entire Boyne City Farmers Market will move to Water and Lake Streets from 8 a.m. to at least noon with several vendors staying all day, until 4pm. The farm market booths will sell a variety of apples and other harvest items including pumpkins, squash, apple butter, jam, honey and cider. Portions of Water Street and Lake Streets will be closed to traffic during the festival to make room for the Farmers Market, music and more than 30 arts and craft vendors. The festival will also include children's games, hay rides, and a scarecrow-making contest for residents and businesses. 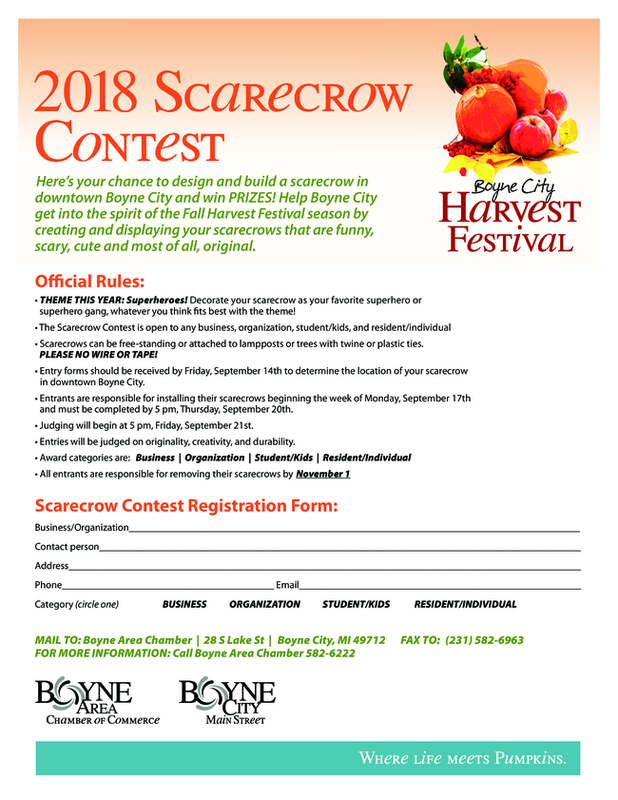 Register for the scarecrow contest in advance. Form available here. Festival hours are 8 a.m. to 4 p.m. Saturday. Shop the market and meander through the crowds to our fabulous downtown shops as well. When you're hungry, stop for a bite to eat in one of our many downtown restaurants. Non-profit groups are encouraged to participate again this year by offering a family friendly activity or kids game. Please email lisa@boynechamber.com to reserve your FREE space at the festival! Please note: Non-profit groups may not provide anything for free that is being sold by another vendor at the Harvest Festival. Click here for a printable vendor application form. 11 a.m. to 1:30 p.m.
Saturday, Sept. 29, 8 a.m. to 4 p.m.